Well... yesterday we discussed the final post-Crisis issue of Action Comics, so I figured why not spend today talking about the first! It's pretty nuts (and refreshing) to see a book emblazoned with "First All-New Issue!" branding... without a #1 in the issue-number box. 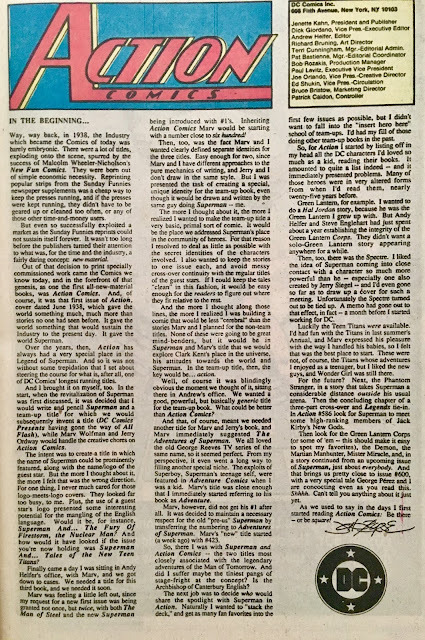 It's almost as if they realized that no matter how big a "#1" you put on the cover... you're still going to be getting a story and character that has a half-century worth of history to it. Imagine an industry that actually embraces its history... rather than trying to disguise it for a to tempt an unwitting (and non-existent) "new" fanbase? It's almost too good to be true... which is probably why it isn't! We open on a Metropolis scene where reporter Carol Samuels is doing some some "on the street" reporting. It doesn't look like it's of much urgency... just a lot of "by golly, my town" sorta stuff. Ya know... I'm not even sure she has a cameraman with her. She might just be insane. 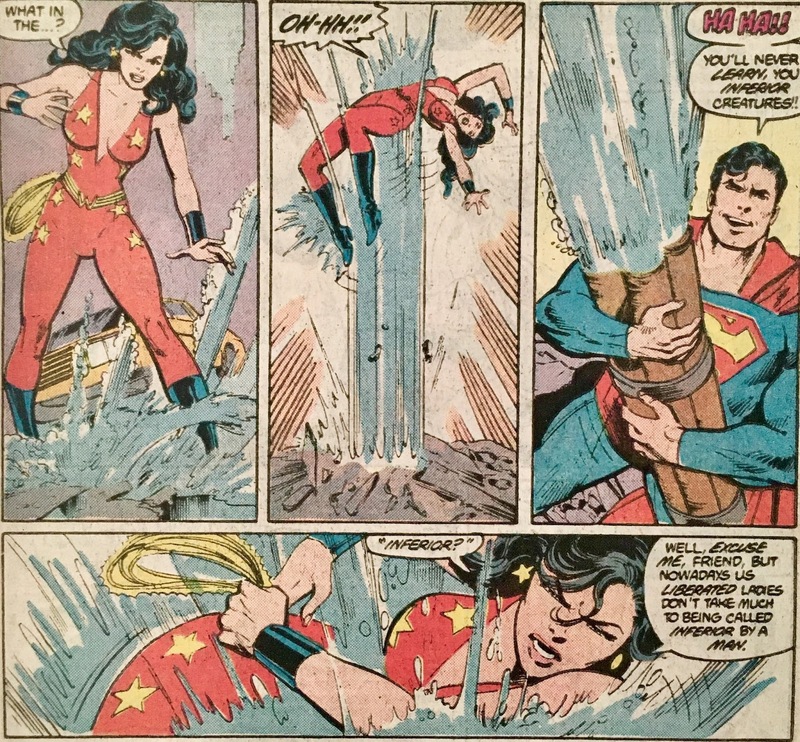 Anyhoo, her monologue is interrupted by the arrival of... not bird nor plane, but... Superman! And, he's wrecking the city! 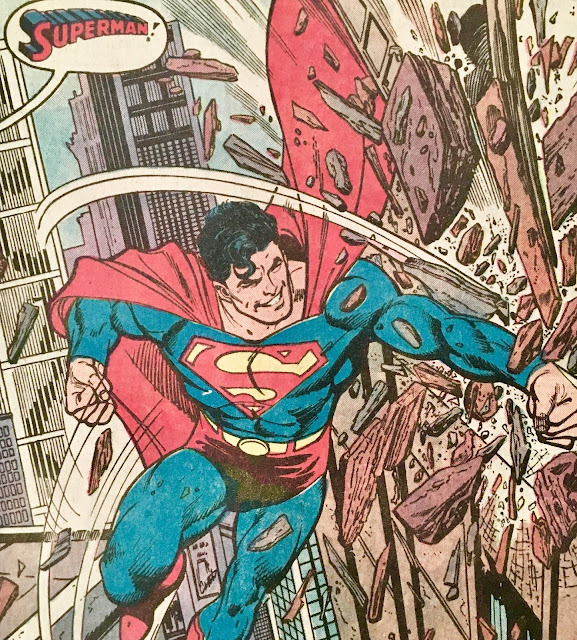 The crowd below watches as Superman proceeds to pulverize some buildings. Lucky for Metropolis there's a certain Titanic Teen among them! Cyborg takes to the skies and is able to pulverize much of the building debris to ensure the folks below don't get smooshed. Then, on the roof... he faces off with the rogue Man of Steel. This doesn't go well for ol' Vic. 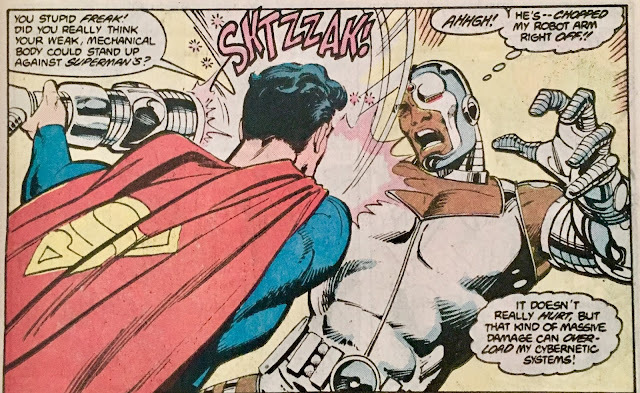 In fact, Superman dismembers and literally bodyslams Cyborg from the top of a skyscraper to the street below. Vic uses this newfound space between he and his foe to make a phone call to Titan's Tower. Gar and Donna answer the call, and after some of our usual Gar-cringe, they're on their way to lend a hand. 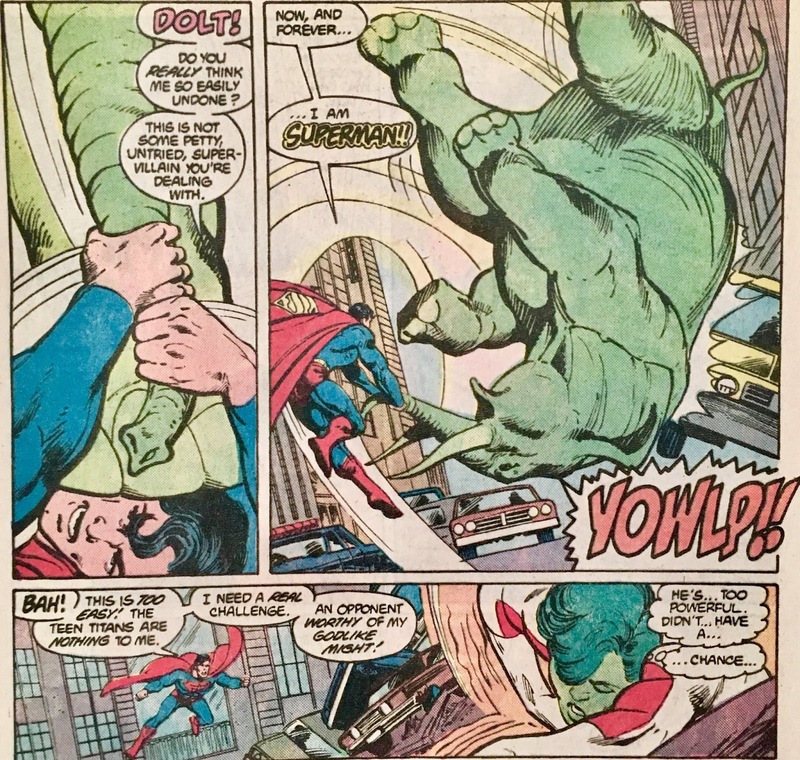 Seemingly moments later, Superman finds himself attacked by a giant green elephant. Considering that he's, ya know, Superman... this doesn't really slow him down. Then Donna jumps in... well, actually she lifts and throws some poor Metropolitan's car in Superman's direction. This, naturally, doesn't do much to slow him down either. 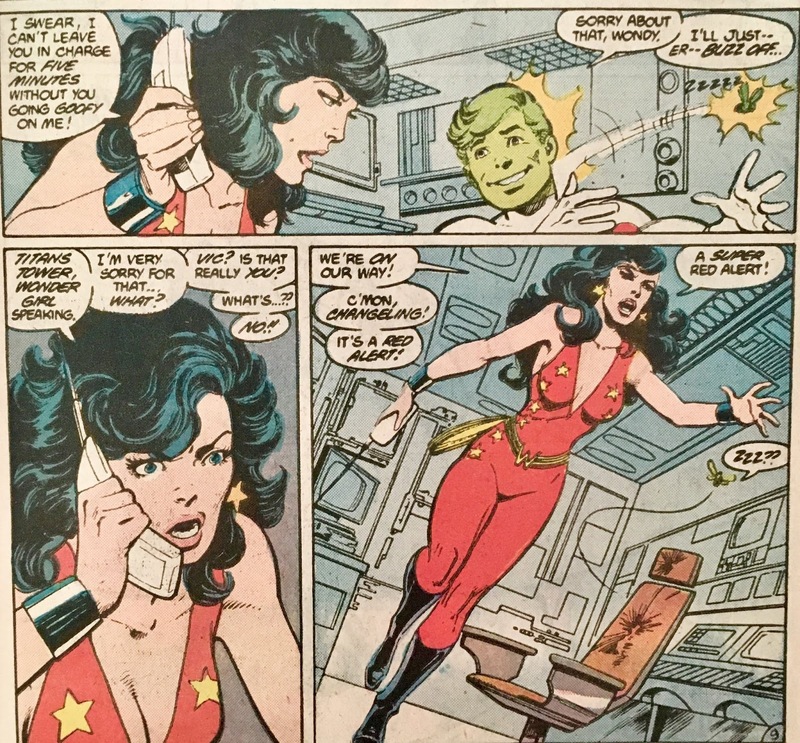 Superman refers to Donna as an "inferior creature", which she immediately takes as him being a sexist. Ya know, rather than just him considering everybody else an "inferior creature". 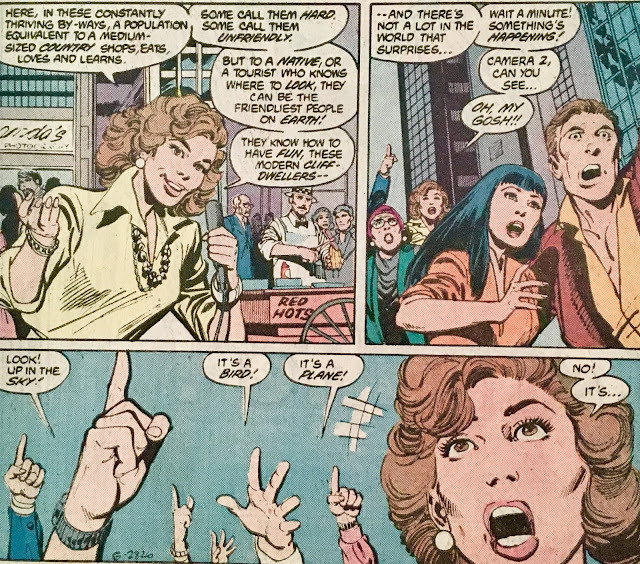 Seems like Donna's got some built-up frustration, don't it? We shift scenes to the Gramercy Street School for the Hearing Impaired... which is apparently a place that really exists... or existed, it might be called something different these days. 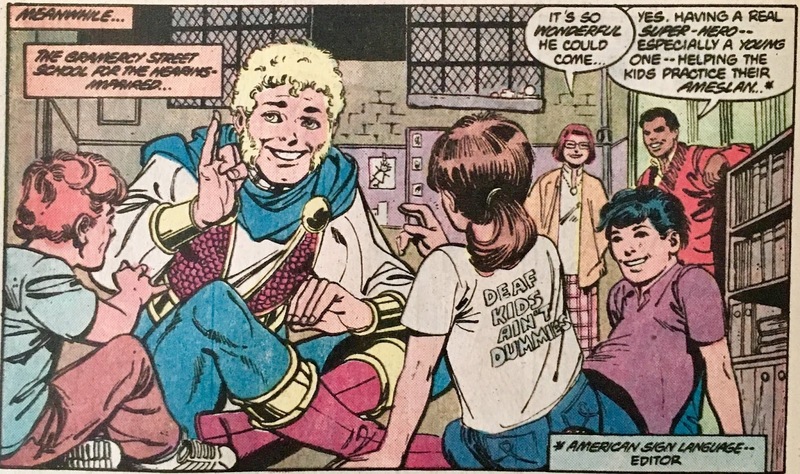 There Jericho is helping some youngsters practice their Ameslan... which is a name for American Sign Language I'd forgotten all about! I'm so used to "ASL" (not in the chat room kinda way), that Ameslan just looks weird! Anyhoo, he learns of what's going down... and heads off to join his fellow Titans. Back in mid-town Metropolis, Superman and the Titans tussle. Superman clearly has the upper hand... until Jericho arrives on the scene! They lock eyes, and then... Contact!, Jericho takes residence in the Body of Steel. Unable to move, Superman begins to rage. The Titans wonder what could've gotten into him, when suddenly... a man appears. He is a small man on crutches... who claims to have the answers the Titans seek. Ya see, that guy in the Superman costume? He ain't the Real Steel Deal... it's this fella on crutches who should be wearing the cape! The Titans... somewhat surprisingly... let the fella talk. 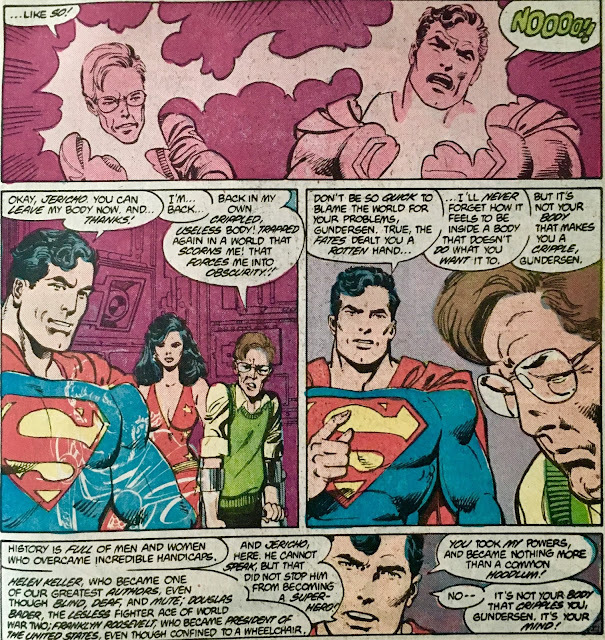 He claims that Clark Kent received a call from David Gundersen with a request to contact Superman so he could help him complete an experiment. Turns out... it was a trap! 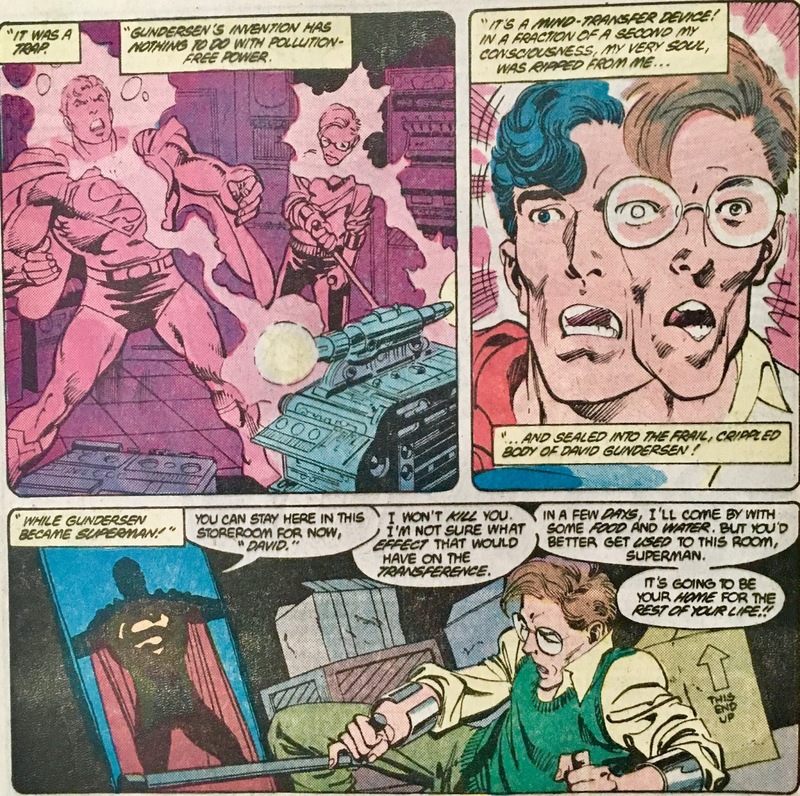 Superman and Gunderson wound up trading bodies. Soooo... the rampaging Supeman was actually Gunderson, and the man on crutches is really Superman. The Titans take Superman and Gunderson back to the lab so they can trade back. Once everyone is back in the right body, Superman gets to lecturing... 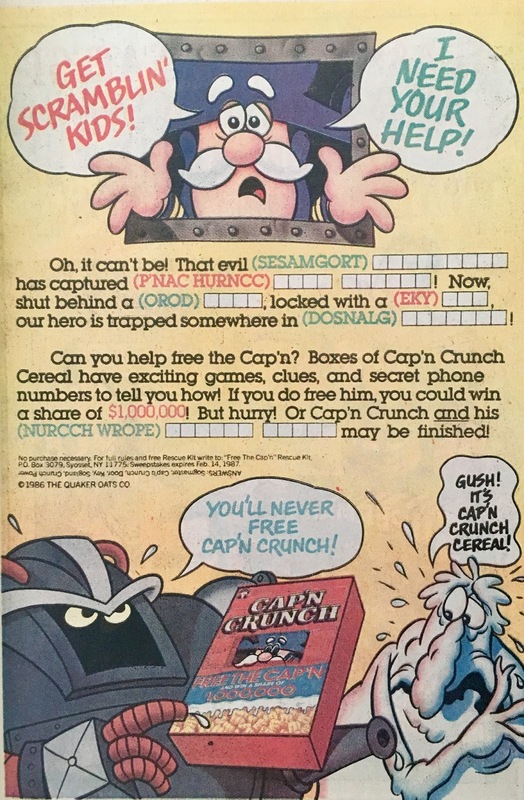 I mean really... look at this bottom panel! We wrap up with Lex Luthor being informed that Superman has been exonerated for the events of the day. He thinks to himself... there might just be a connection between Superman and Clark Kent. Nothing says "Welcome to the post-Crisis era!" like rehashing a story that must've happened dozens of times during the Golden, Silver and Bronze Ages, right? 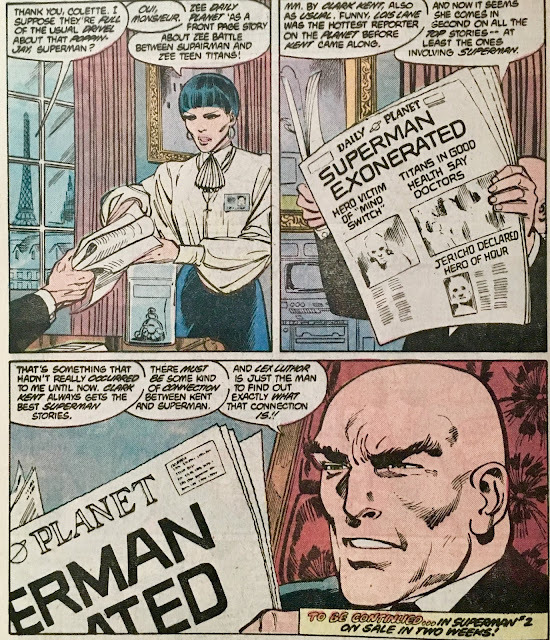 I mean, how many times do we have to see a "Superman's body taken over" story? 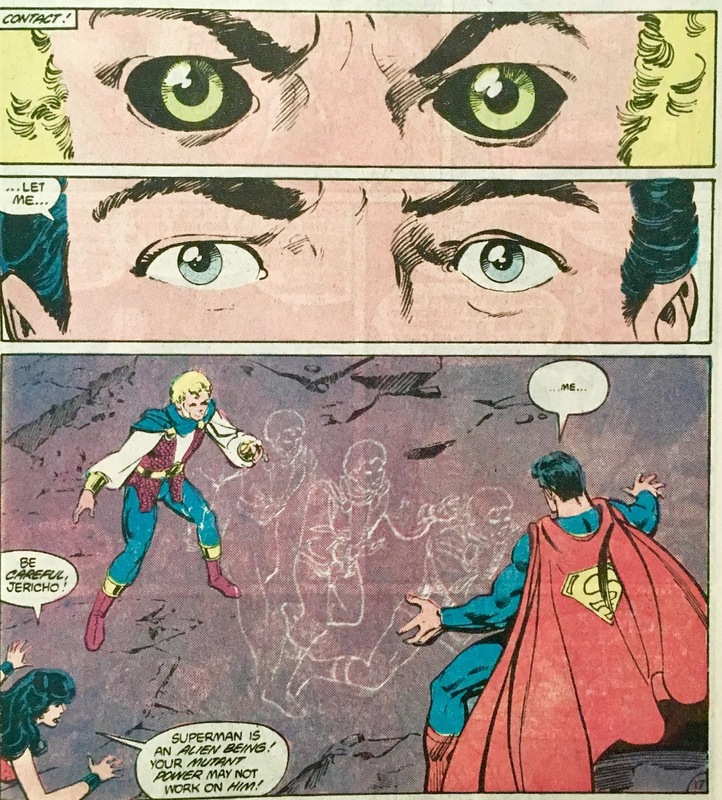 I feel like the only Superman story that we see more is (a take on) the origin! In spite of that... this was a good time. 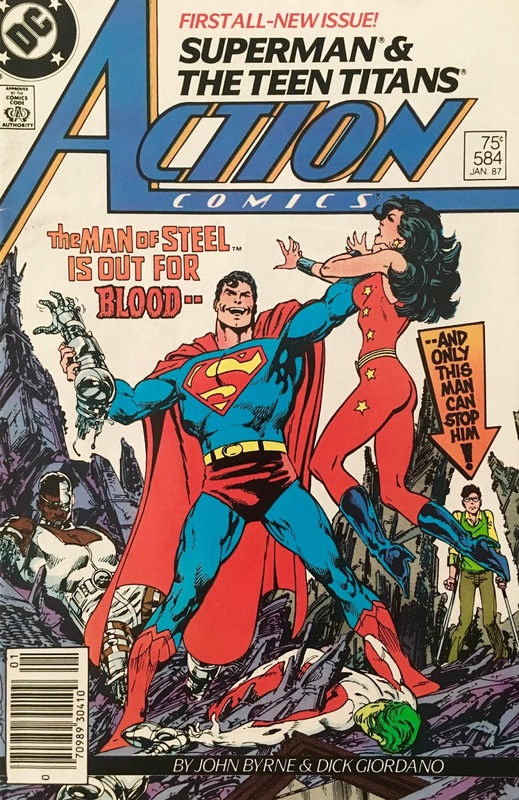 I'm always down for some Titans... and I guess it made sense for Byrne to include one of DC's hottest properties into this "First All-New Issue" of Action Comics. It's almost a can't-miss situation... folks are either going to come to see what this "new" Superman is all about... or they'll want to see the New Teen Titans. Either way, they're going to check this out. For the story, well... there's not a whole lot to it. Like I said, it's nothing we haven't seen (many times) before. 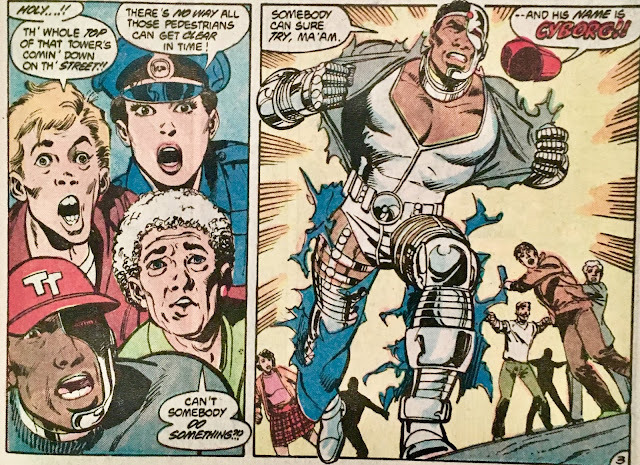 The Byrne-art is what we'd expect from him in mid-late 80's... and looking at that Gundersen fella... has there ever been a more "John Byrne character" ever put to paper? I mean, there's no mistaking who drew this guy! Overall... for such a "landmark" issue, I find myself at a loss. There just isn't all that much to say. This is post-Crisis... it's the start of the Action Comics-as-a-Superman-team-up-book... it guest stars the New Teen Titans. I'd expect more from a "launch", but at the same time, can't really get mad at it. This issue has been collected in Superman: The Man of Steel, Volume 2 and is available digitally. I wonder if Donna's frustrations have anything to do do with her curly haired ginger husband? You might just be onto something... after being hounded to help him with his professorial publication day after day, she might've been looking for the opportunity to spout off her frustrations and just hit something! I did enjoy the new tweak on the original Action Comics logo too. Up until then the logo looked even more like the original from issue #1. I always enjoy the minor tweaks on the Action logo! They always keep the "classic" feel, but updated to signify a new era (even the 90's "swoop" logo had the proper font). 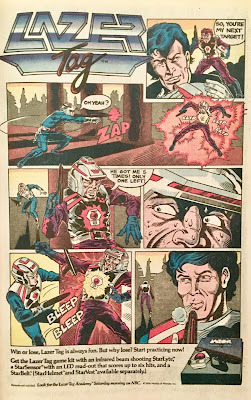 I was just scrolling through my Action100 page, and noted how the logo was altered in every era. 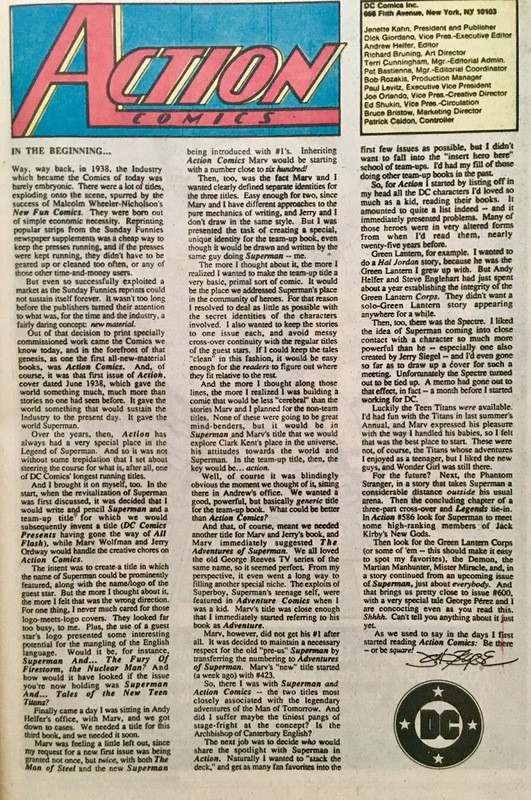 I wasn't reading DC when this came out the first time around, but I could only imagine what an exciting time that must've been! I think that was the idea, just do a fun story with no relevance since this was the first post crisis story.